Sponsored ride update: 1 down, 1 DNF, 2 to go. By now I should have completed 2 of my 4 2013 sponsored rides unfortunately though that is not the case! 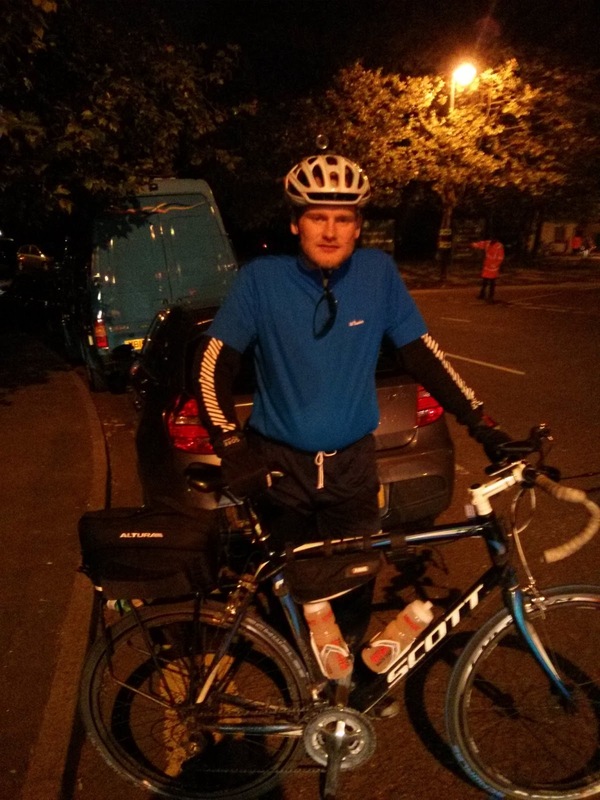 For the first week in June I was preparing for Nightrider and really looking forward to it. I was taking it easy on my normal commuting rides (partly to recover from King of the Downs, partly to be rested for Nightrider), I cut down on the number of my commuting rides and I was also staying up much later at night to get my body clock prepared for my late night ride. On Thursday night I stayed up till midnight and got up at 9. On Friday night I stayed up till 4 and slept till 12. On Saturday night I was ready and raring to go. My wonderful support crew Linzi dropped me off and at 10:30 I was ready to go well ahead of my 11:10 start time. The event was running a little ahead of time so I was able to start a bit earlier than my allotted time. We had a brief talk about safety and then we were off, along a short access road out of Crystal palace, up to a junction with a main road and off down the first hill. I was really looking forward to my cycle through London through the middle of the night. 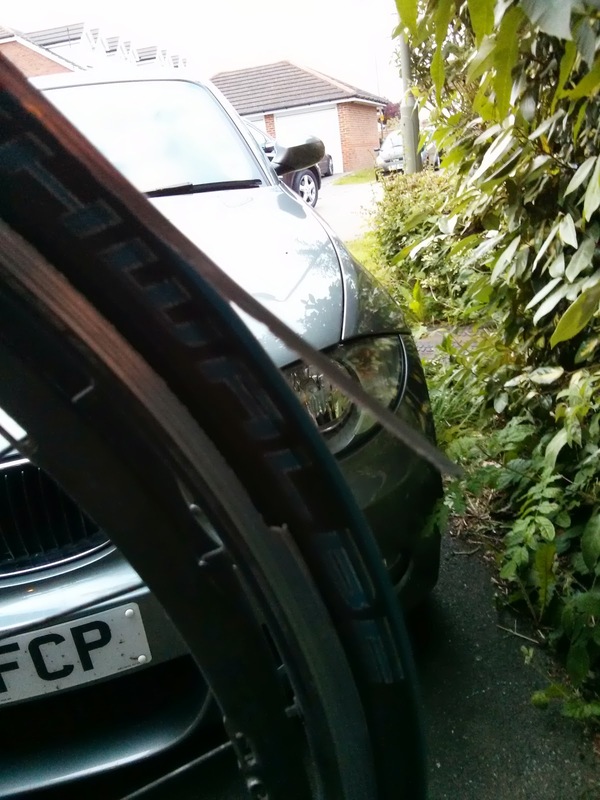 Well, I didn't have a spare wheel on me! The mechanics at the start point didn't have a spare wheel either so there was nothing I could do - I had to give up. Without a rear wheel I couldn't do the route. I couldn't even wheel my bike along as the broken rim was rubbing on the brakes. I was really disappointed by this, utterly gutted. This was the ride that I was looking forward to the most. I am doing Nightrider in Paris later in the year but I don't know Paris, it's not my city so it's not as special. 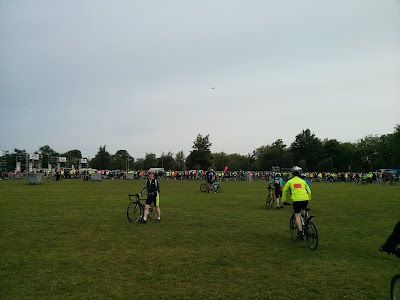 Next up in my series of rides was London to Brighton (L2B). This is the 4th time I've done this ride (the 3rd time I've done it for the British Heart Foundation). It's a nice ride that's not too hard - other than the final hill Ditchling Beacon. I made similar preparations for this ride as I did for Nightrider, took my commuting rides a bit easy and took a few less rides. Linzi had done a great job putting together a T-shirt for me with Alastair on the front and with a list of all my rides on the back. 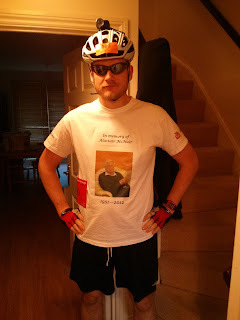 I do these rides because I enjoy them but I am really pleased to be able to raise money for the BHF in Alastair's memory. This T-shirt lets people know why I am doing the rides. I got started at about 6:10 once all the people in front of me got through the narrow gate at the exit of Clapham Common. There were a lot of people in front of me but after 5 miles or so they thinned out quite a bit. I had a great ride and really enjoyed it. I felt really strong and was going pretty quick for the whole 53 miles. Even right at the end after the tough ascent of Ditchling Beacon I was able to do a sprint finish getting up to 29 MPH to finish in about 10 seconds short of 3 hours 30 minutes. About 30 minutes better than last year. That's about it for now. The next ride is the 100 mile London ride in early August. I am planning on doing a 75 mile ride around 3 weeks before that in preparation. 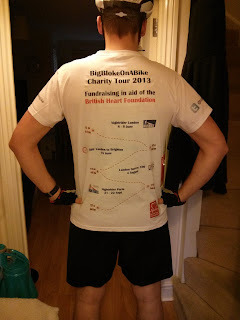 I'll do another update after the London 100 as that one is going to be a bit of a challenge. 100 miles is a long way and will be the longest I've ever ridden. Well the sponsorship effort is going pretty well so far so thank you to everyone who has donated. I have raised £970 of my chosen target of £1000 so far so very close to reaching it. I am confident that by the time I have completed all my events I'll get there. Yesterday (Sunday) I did my first and only proper training ride this year. This was The King of the Downs, a ride organised by Evans cycles that I did last year. It is a 55 mile ride with 5 tough hills. This is actually probably tougher than all of my rides except for the 100 mile ride in August. I was really pleased with my performance on the ride. I managed to shave nearly half an hour off my moving time (4ish hours down to 3 and a half) from last year and pretty much an hour off my total time. This was largely because I only stopped once and didn't walk up any of the hills. As well as improvements in the overall time I got much better times on all the hills in the ride. This is not really a surprise as I am over 40lbs (about 18 kgs) lighter this time round than last year. That is quite a lot of extra weight to haul up the hills so I had a big advantage this time! Other than this ride I haven't done any specific training at all but I have been doing my normal commute to work - this is up to 180 miles a week if I ride all 5 days. In a normal week I will cycle all 5 days. In May there was a challenge on Strava to do 1000km in one month. I thought that I was going to reach this but missed by only about a day's commute! Too many bank holidays and things to get to after work! I shouldn't have a problem getting to 1000km in June though with all my charity rides. This Saturday is the first charity ride. It's the London Nightrider which I am really looking forward to. Last year was great fun and I hope it'll be just as good this year. The weekend after that is the London to Brighton ride which I am looking forward to as well. I've got a nice early start (6:00 AM) so shouldn't have problems with traffic getting in my way. I think the weekend after that I'll have a bit of a rest after 3 weekends filled with 50 mile plus rides! That's it for now. I'll do another update and let you know how the first lot of charity rides go.